Thanks for a great conversation in Norfolk! "The panels were great, the MCs did a nice job. The events were very well done and well organized. It will be great to see the video." "This was eye-opening for me. Sometimes we need to be brought up to speed on reality. We need our eyes opened to become informed citizens." "[This program was] very informative and helpful it made me realize my responsibility of becoming an informed citizen, and the correct means of staying informed." 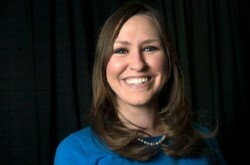 Jenna Johnson is a national political correspondent for The Washington Post who writes about campaigns, voters and party identity. She previously covered the White House and Donald Trump’s campaign for president, interviewing thousands of Trump supporters at more than 170 rallies in 35 states. Jenna grew up in Omaha and attended the University of Nebraska-Lincoln, where she was the editor of the Daily Nebraskan student newspaper and interned at the Norfolk Daily News in 2004. After graduating in 2007, she got an internship at the Post covering D.C. crime and has spent her whole career at the paper. Her parents own a weekly newspaper in Kalona, Ia. Jenna lives in D.C. with her partner, Derek Hills. During the past 30 years, Clark Kauffman has worked as both an investigative reporter and an editorial writer Iowa’s largest newspapers. During that time, he has won 20 first-place state press association awards for his reporting and editorial writing, and his 2004 series on prosecutorial misconduct in Iowa was named a finalist for the Pulitzer Prize for Investigative Reporting. Kauffman joined the Register’s Opinion Page staff in September 2014 and was the newspaper’s last full-time editorial writer before returning to investigative reporting in August 2017. 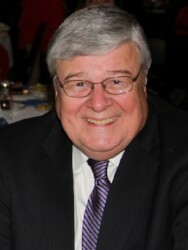 Francis L. “Frank” Partsch is the retired editorial page editor of The Omaha World-Herald, having held the post in 1982-2002 and 2004-2005. 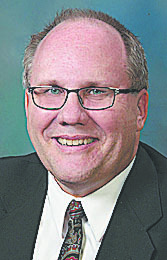 A native of St. Paul, Neb., with journalism degrees from the University of Nebraska (now UNL) and The Ohio State University, Partsch joined The World-Herald in 1976 as chief of its state capital bureau in Lincoln. He had spent the previous four years as editor of the thrice-weekly Sidney Telegraph in the Nebraska Panhandle. Under his editorship, the Sidney newspaper received Nebraska Press Association awards for an editorial, and for community service and service to agriculture, as well as National Newspaper Association awards in the latter two categories. He had come to Sidney from Chicago, where he was a staff reporter in the Midwest bureau of The Wall Street Journal in 1970-72, focusing on agriculture and the food industry. A member of the National Conference of Editorial Writers (absorbed into the American Society of Newspaper Editors in 2016) starting in 1985, he served on that organization’s board of directors and edited its quarterly journal, The Masthead, in 2003 and 2004. In 2007, he was inducted into the Nebraska Journalism Hall of Fame and the following year received a dean’s award from the University of Nebraska-Lincoln College of Journalism and Mass Communications, formerly the N.U. School of Journalism. He was given a life membership in the National Conference of Editorial Writers, and, in 2016 was inducted into the Omaha Press Club Journalists of Excellence Hall of Fame. From 2005 until early 2008, he remained with The World-Herald as a part-time assistant to the publisher. 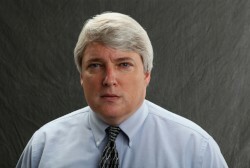 Kent Warneke is editor and vice president of the Norfolk Daily News. After graduating from the University of Nebraska-Lincoln, Kent worked at the Omaha World-Herald from 1982 to 1987, and then at the Norfolk Daily News as managing editor from 1987 until becoming editor in 1992. Kent's civic involvement includes serving on Humanities Nebraska's Foundation board; as board member and president of the Norfolk Area Chamber of Commerce; vice chairman of the board of the Nebraska District Lutheran Church-Missouri Synod; board member and chairman of Faith Regional Health Services in Norfolk; and founder and past chairman of the Great American Comedy Festival. Kent's professional involvement includes serving as a board member and president of the Nebraska Press Association and as a member of UNL College of Journalism and Mass Communications advisory board.